There is no doubt that affiliate marketing is the most popular way to make huge money. You just need to join affiliate program and promote them on your blog, In return you will get commission for any sale which generate through your affiliate link. I have already shared why affiliate marketing is better than adsense to earn more money. When It comes to affiliate marketing, the very first thing which you need to do is choose right product to promote on your site and also write reviews on the product you use, so readers will know pros and cons of any product. Shareasale is the biggest platform to join different affiliate platforms and you can easily get approval from different affiliate program. Let`s see what other bloggers suggest to boost affiliate sales. I like affiliate marketing as an additional source of income to my own products. It's a great way to monetize sites with products you can't offer, haven't created yet or aren't willing to create. Make sure to offer products from a trusted vendor because it will convert much better than any unknown eCommerce shop site. Amazon for example, is one of the best converting affiliate product vendors simply because most people know and trust Amazon so they are willing to buy from them. If you use less known vendors make sure they sell through a website which at least looks serious, provides contact information and has an SSL certificate. You only want to sell high-quality products. This means you need to look at reviews offered around the web or even test the product yourself. If that isn't possible only sell stuff from bigger brands or known product creators. Be prepared to get some complaints and commission refunds if you link to low-quality items. That's you. To have success with affiliate marketing you need to write amazing content with some strong call to actions. This can be implemented through visuals like buttons or images and at the same time through your copywriting. On top of this you need to be honest about the products and tell your folks about a bad product once in a while - this helps you to look more legit. Last but not least optimize your conversions be testing and tweaking and also drive enough traffic. Affiliate marketing has lower margins than selling on your own so it's a numbers game. I think one of the problems is that many people think that creating a website and putting affiliate links on will magically make them passive income. The site has to be of value to people and be seen as an authority. How can people do this? Constantly creating great content that is useful for their readers. Sharing their content on social media (but not overly or too in your face). Constantly keeping up to date and engaging with their site and readers. Become part of the "community." They also have to ensure they are optimizing their site properly. Also, I really think that you if you are making a site "just to make money," people can sense it and tend not to visit. If you are truly passionate about a topic then people are more likely to respond to that. Without a relationship and trust nobody will believe your recommendations. The same principle applies here as elsewhere in marketing: Give advice, give help, give time and build a relationship. So these are the few tips to boost affiliate sales and make huge money. If you have any question or suggestion, feel free to ask me. I promote information products 1) because it's easier to come up with things to say about them and 2) because the commission rate is much higher. I've found that the most effective way to promote them is to write an honest review and share what I have achieved as a result of using the product. The key is to promote only products that you absolutely love - your enthusiasm shows in your writing and people are compelled to buy. Using this his approach usually means that you will have to buy the product first, that's why I will probably never make full time income as an affiliate - I have limited time and funds to spend on information products and I don't love everything I buy, far from it. How to make more affiliate sales. My first $205 to make as an affiliate came during a 65% promo discount sales of SEO Powersuite all-in-one SEO tools. After that, I have made more sales during companies running promo discount sales than any other time. Also, having a healthy email subscribers is another great way to make more sales as an affiliate if you had target your opt-in offer/subscribers to a related product/service, this makes everyone on your list well targeted and responsive to your follow up messages. Building email list of responsive subscribers is a most for every aspiring affiliate marketer. Promoting of high ticket product/services, it could be more quicker to make $500 commission when you promote a product of $900 with 33% commission, you only need two sales to cross that amount than promoting a $47 ebook and aiming to make same $500 commission. You may think it will be more easier to make more sales with a $47 ebook than to do with a $900 product, no. Is all about finding the right audience for the products or services. Most affiliate marketers always try to sale in their sales copy, this is one of the reason they never make money from affiliate marketing. The job of an affiliate marketer is not to sale the product/services, but to pre-sale and to enlighten the prospect on the benefits, advantages, disadvantages, features and why the product may be better option for his needs or wants. Currently, I have had the most success with BlueSnap Affiliate program and Share-a-sale affiliate program. I am the Affiliate Liason for Transamerican Auto Parts, the owners of the ecommerce sites 4WheelParts.com and 4WD.com. 4WheelParts.com sells parts for truck, Jeep, SUV and ATV owners. 4WD.com sells parts exclusively for Jeep owners. So 4WD.com is never going to have quite as much sales volume as 4Wheelparts.com because it only sells parts for one make of vehicle. That said, here are some analysis I did to increase affiliate sales on 4WD.com. I went through every single link 4WheelParts.com had available on a particular affiliate sales platform. I looked at each publisher that was hosting that link. Then I went to the corresponding link on 4WD.com and looked at each publisher that was hosting the corresponding 4WD.com link. It was 90% overlap. Most publishers hosting a particular 4WheelParts.com link were also hosting the corresponding 4WD.com link. But for the 10% that were not, I contacted them individually and asked said "Since you are generating sales with the 4WheelParts.com link, please also host the corresponding 4WD.com link". Every month I send a newsletter to the publishers hosting my employer's links. I use the affiliate platform dashboard to send the newsletter. It announces the incentives and offers for the upcoming month. There are 2000+ publishers hosting my employers link but in actually analyzing the e-mail send I noticed it was only getting opened by 200 or so publishers. Well, a 1% open rate is not bad in email marketing but I needed more publishers to be aware of what my employer was offering. So I went onto Google Plus and I looked up every publisher website. I ended up creating a Google Plus circle just for publishers on that particular Affiliate Platform. The circle has over 400+ profiles and/or pages in it. Now, each month I duplicate the publisher newsletter in the format of a Google Slideshare presentation. I post that presentation privately to my Google Plus Affliliate Publisher cirlce. I get way more engagement from publishers on the Google Plus Presentation post than I do on the newsletter I send from the affiliate platform dashboard. One simple reason is that a lot of publishers set up their profile information on the affiliate platform when they first set up their website and they never updated it. So the newsletter is going to an old email address or an email address they never check. While notifications that someone sent a Google Plus post directly to them are going to their current email. Anyway, by connecting with publishers on Google Plus I have a lot more of them asking me about specific offers, and more importantly, informing me about promotional placement opportunities on their websites in which my employer might have an interest. The actions above did not create a magic bullet of astronomically increased sales. But by doing analysis and by making a connection with publishers, sales are increasing incrementally. For every offer I create a text link and banner links in all available sizes. I plan to start creating multiple text links for a single offer (in addition to banner adverts) to see what wording works best in getting click through. This is the same analysis done in AdWords. I plan on looking up every publisher on Facebook the same way I did on Google Plus. Now that Facebook allows users to create posts only seen by certain groups, I can reach out to publishers with messaging specifically for them on Facebook just like on Google Plus. I hope to catch publishers on Facebook that are not active on Google Plus and thus increase my overall volume of publishers with whom I am personally interacting. 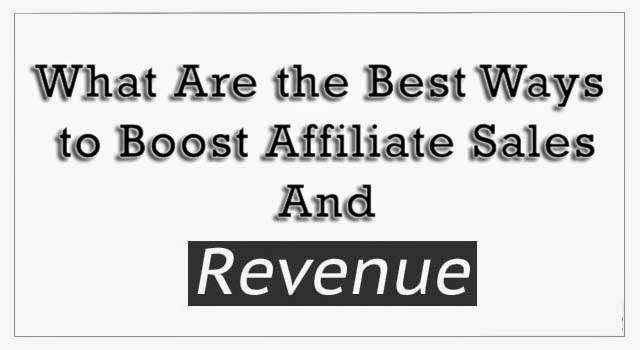 Do share how you boost affiliate sales and which affiliate programs you use.